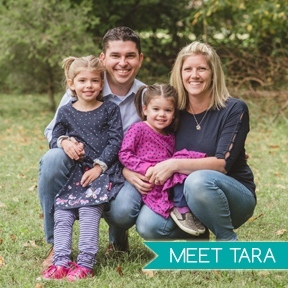 Disclosure: I am a Tiny Prints affiliate and was compensated with products for this post. While this post contains affiliate links, the opinions expressed are all mine! 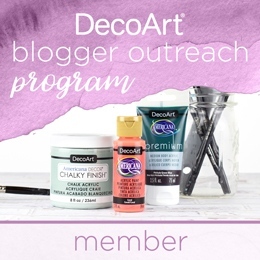 Note: I only promote and share products I personally use and recommend! To learn more, please review my disclosure policy here. 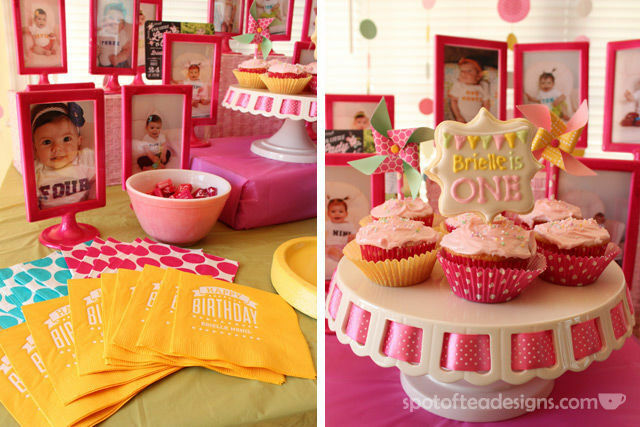 We started dreaming up Brielle’s first birthday party months before the big day. We knew a few things: a) we didn’t want a ton of people so we were going to the “family only” route b) we wanted to cater the food so we didn’t have to cook c) it had to include some DIY elements! 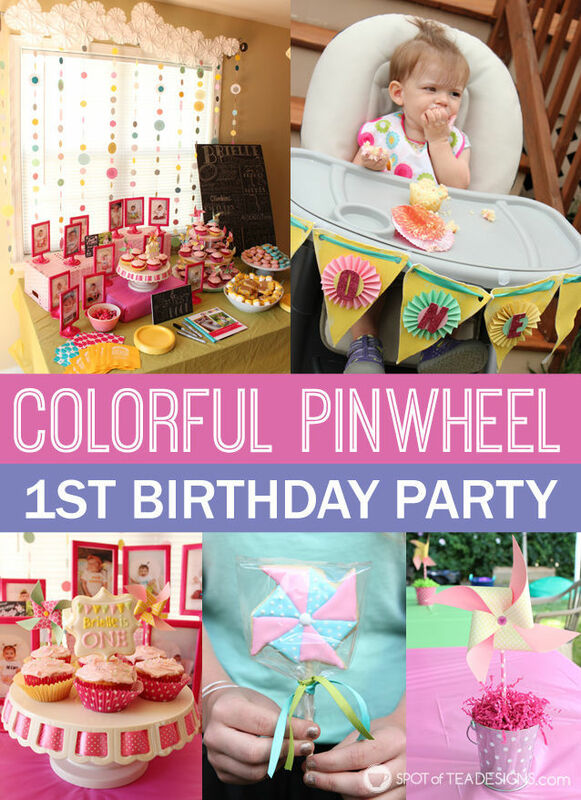 So please excuse this photo overload post but I’m very excited to share the details of Brielle’s big day and her pinwheel themed 1st birthday party! 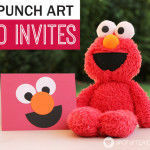 I knew that I would be doing a bunch of DIY craft projects for the party so when it came time to invite our guests, I decided not to design my own but instead went straight to the experts – Tiny Prints! 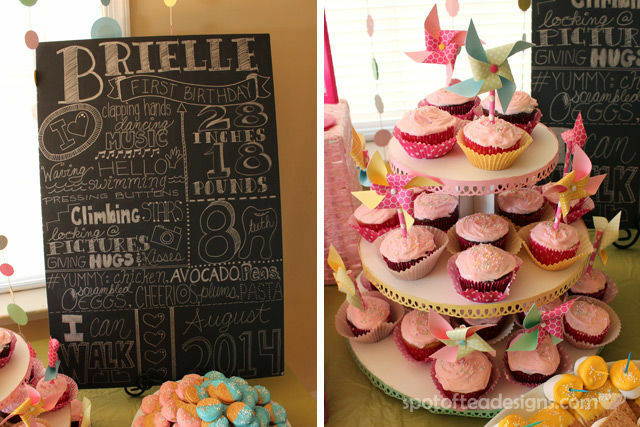 After clicking through page upon page of 1st birthday invitations, I settled on a chalkboard like design called “Precious One” and ended up being so inspired that I added chalkboard accents throughout the party! With a theme like pinwheels, I made sure there was a bunch on display. I made my own using this technique and hot glued them to wood skewers and paper straws. Yep they were for display only and did not spin. Look for an upcoming post with a little more detail about these guys. 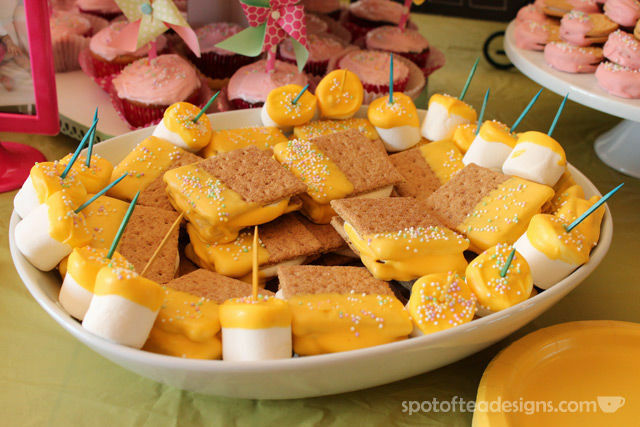 This dessert table became my main focus for the party décor. 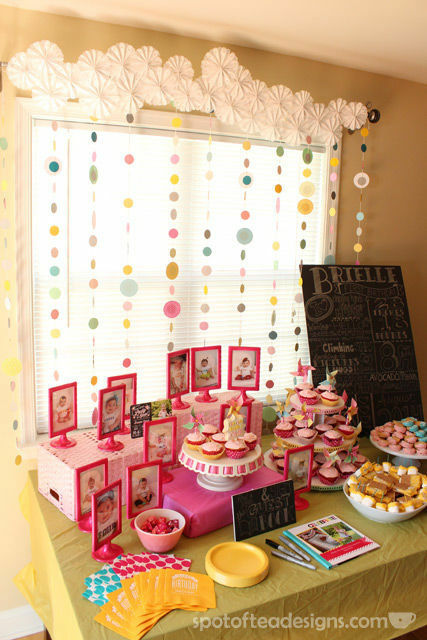 I was very lucky to reuse the polka dot garland Allie made for my baby shower as the background for Brielle’s dessert table. The top was also a semi homemade approach using a Martha Stewart garland kit that I altered to hide the curtain rod. 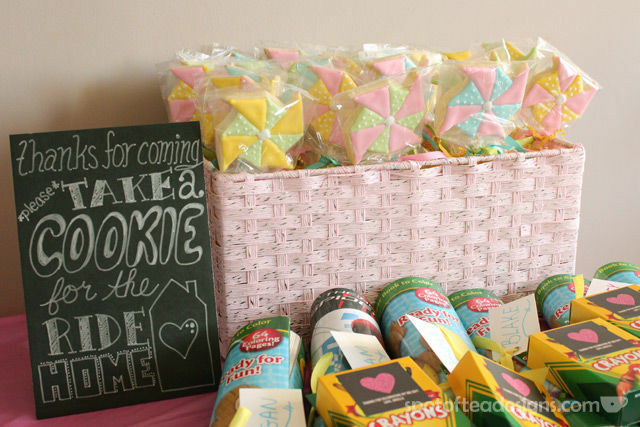 I brought in the chalkboard look inspired by my Tiny Prints invitation with faux chalkboard signs. 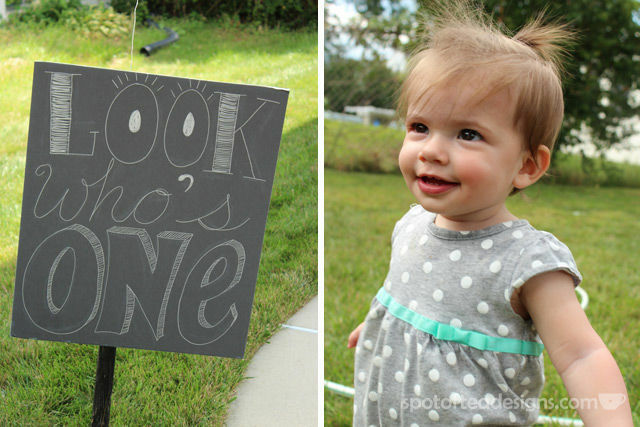 I used a metallic Sharpie on black foam core to freehand one of those trendy “First Birthday Stats” boards. I love how it came out and showed off all that my daughter was up to these days! The center of the table showcased an old Martha Stewart Crafts cardboard cupcake stand I had from my days at EK, that I dressed up with some punched border pieces. Homemade cupcakes were lined up on top with yet more DIY pinwheel cupcake toppers. 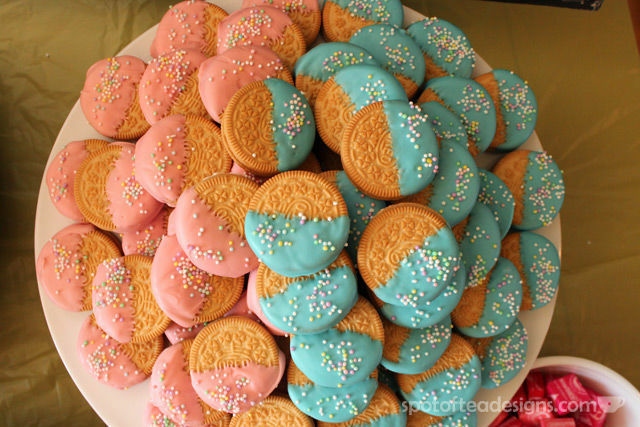 Colorful homemade chocolate covered Oreos and Smores rounded out the dessert selection. 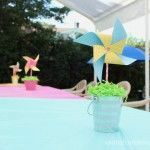 If guests made a mess, they could easily pick up a custom birthday banner napkin that matched our pink, teal, mint green and bright yellow décor. Each month I had been taking photos of Brielle in monthly onesies on the pink rocking chair in her nursery. 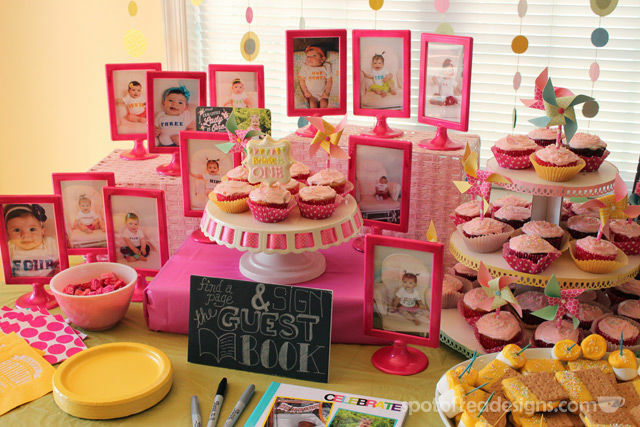 I displayed them in vertical frames throughout the dessert table that I spray painted for the party. 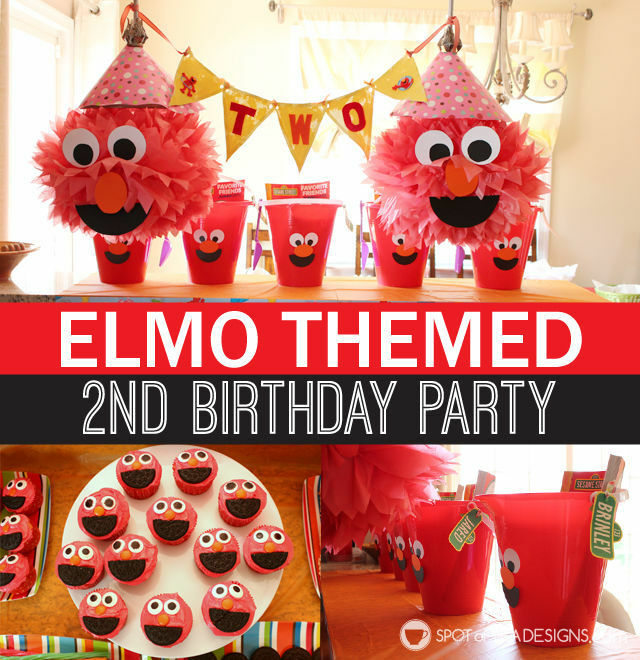 Learn more details about these here! Since we redid our garage last summer and added a second fridge, it became a convenient place for the drinks for a party. 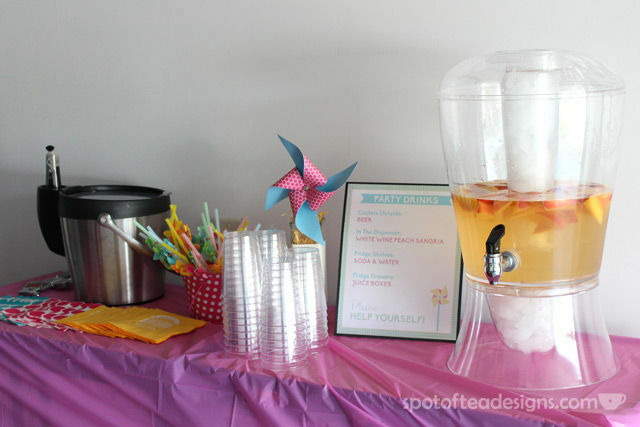 I added a little drink station on Derek’s work table (which will be featured in an upcoming Garage Makeover Part II post) and made sure to include signs to direct guests to all the drink options available. 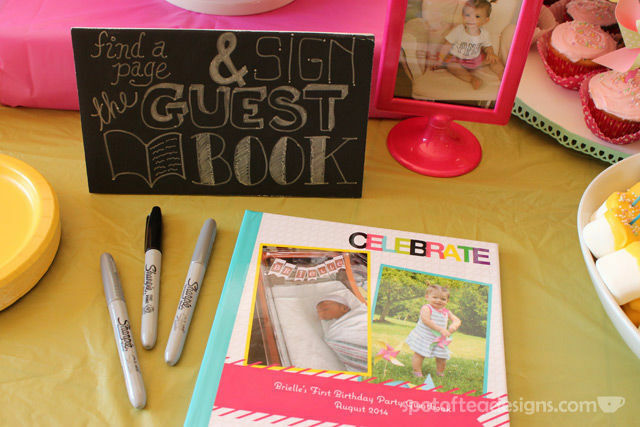 A Shutterfly photobook served as a guest book for everyone to sign. It included some of our favorite photos of Brielle blown up to fit the full page, which was fun to flip through. 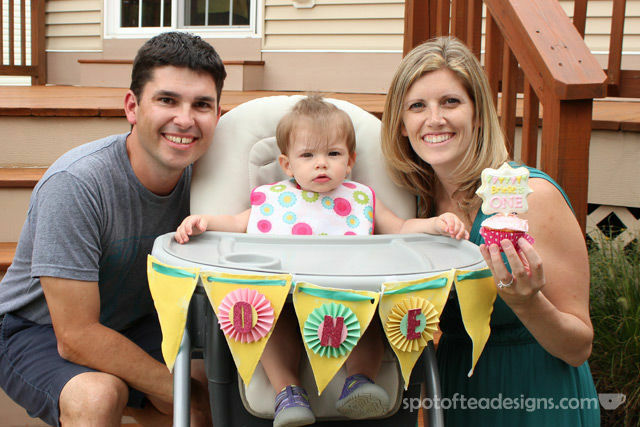 Brielle enjoyed her second taste of sugar on her big day. (The first was a few days earlier on her actual birthday). 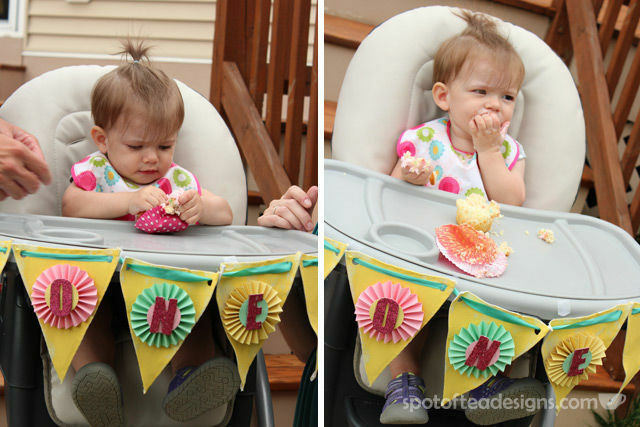 A custom highchair garland was needed to capture this fun moment! 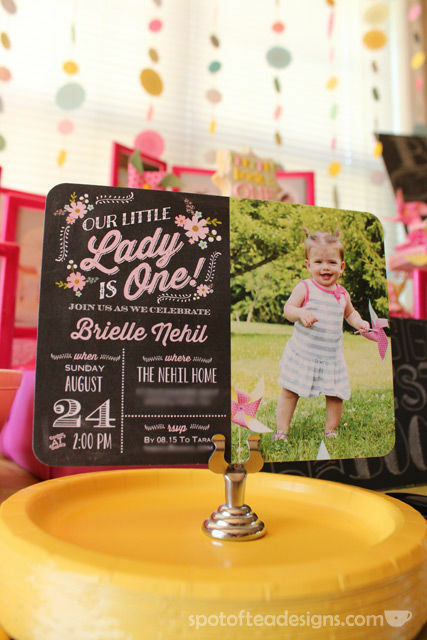 (Learn how I made one for her sister two years later!) And boy did she love that icing! Each of the cousins who came to celebrate received a rolled up coloring book and pack of crayons for future coloring adventures! 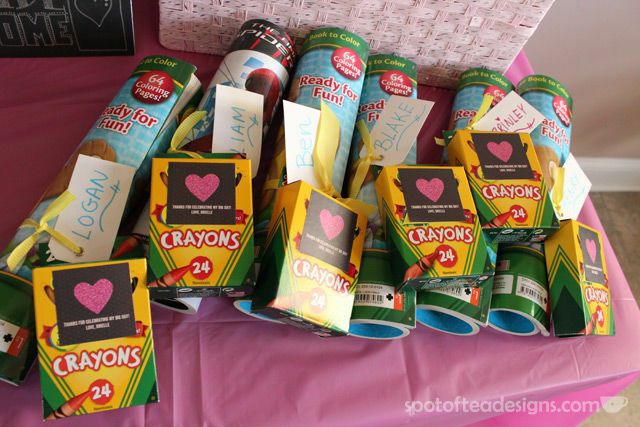 I love encourage crafty art time with the kids! For the adults and older kids, I was VERY happy and honored when my friend Cherylin offered to make her adorable sugar cookies. 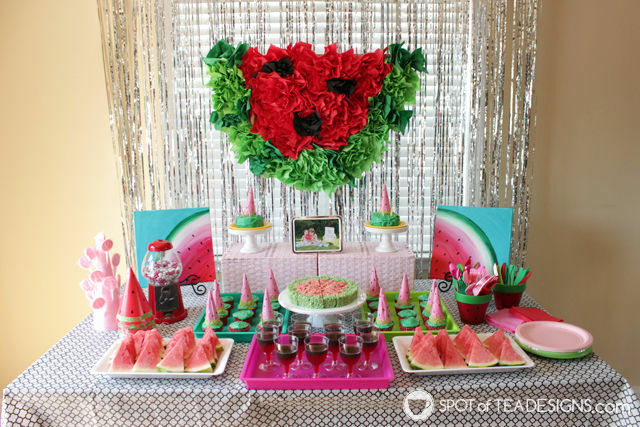 You’ve already seen Cherylin’s cookie magic for my work bridal shower, work baby shower, and Brielle’s first Christmas and now you can see what she does for parties! 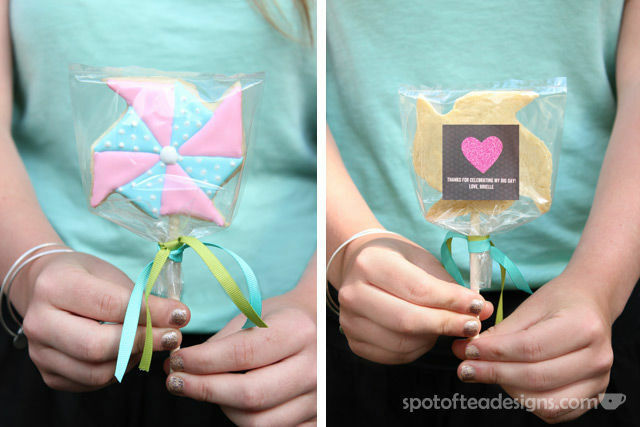 Cherylin also create a cookie pop for Brielle’s cupcake when we sang Happy Birthday. Look how cute this is!!! 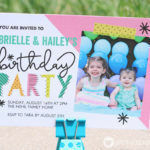 Overall, I was so happy with how the party decorations came out, but even more happy with the BEAUTIFUL weather that day and the fun Brielle had with all her family around! 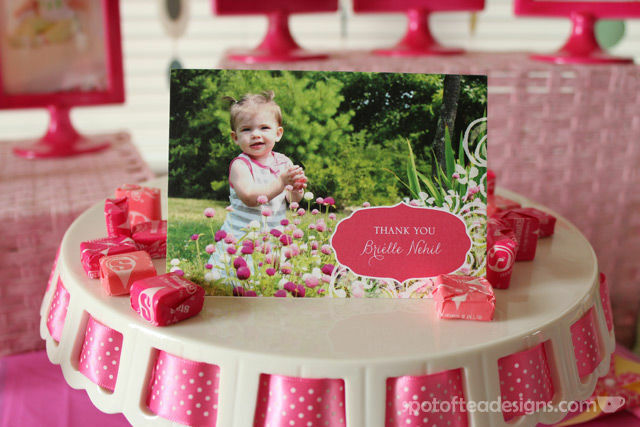 Learn how we celebrated her second birthday. Fun, fun, fun!! !i also decorate sugar cookies, so I was pleased to see Cherylin’s cookies! Most people have no idea how much work they are to do! Love the ones you did also. 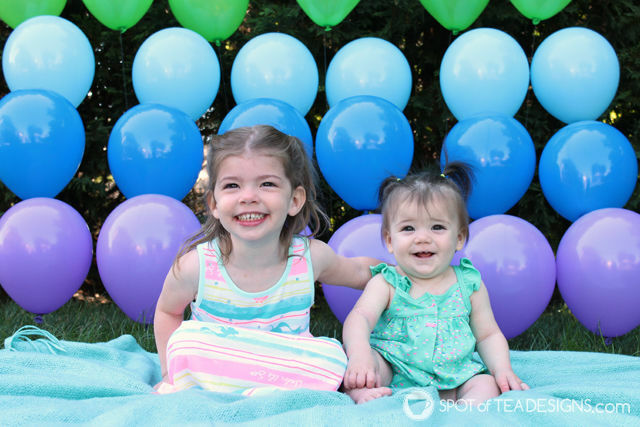 Great job on the first birthday party! 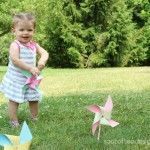 I LOVE that you made all your fabulous pinwheels yourself! Everything you made is so adorable. 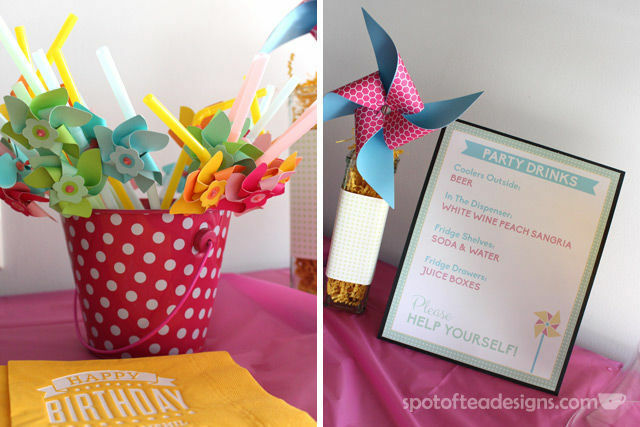 I would love to know how you made the pinwheel straw favors at your drink station. 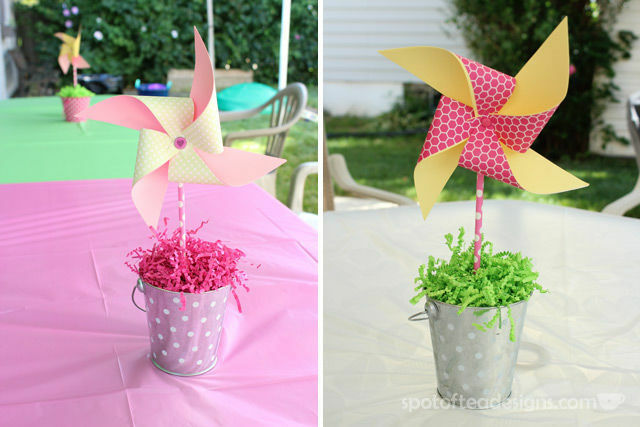 I’m always looking for new ideas for pinwheels. Please share! Thanks Jill! I actually got those ones at Target at the after Easter clearance. Thanks for stopping by!